For the past couple of weeks I've been uploading my annual Christmas gift guides and they've been so popular this year, more than ever before. My final gift guide of the year was put together for the little ones in our lives, the babies. In my baby gift guide I included a lot of practical and useful items because for me as a parent with a baby, those kind of gifts are appreciated more that ten dozen different toys. One of my favourite items that I included this year has got to be the aden + anais Dream Blanket, read below to find out why. Here's a little background about aden + anais, one of the many reasons why they are one of my favourite baby brands. Once upon a time, a new mum found herself searching high and low for the muslin swaddle blankets that her mother, grandmother and generations of Australian women before them had used to comfort their own babies. When she couldn’t find them anywhere in her adopted home of the USA, she made them herself, and aden + anais was born. aden + anais believe that soft, breathable muslin is the only fabric you should use on your babies. Perfect for those born to sparkle, their 100% cotton muslin dream blanket gets a metallic makeover with new prints that are as soft as they are shimmery. 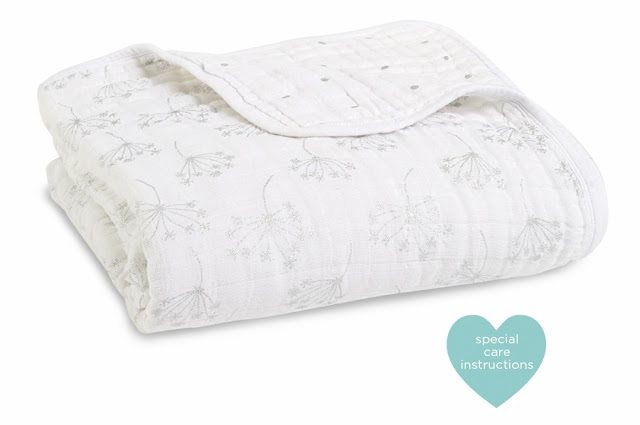 Made with four layers of breathable muslin, aden + anais dream blanket’s uses go beyond cuddling, as it also makes a snuggly surface to lay your little one on no matter where the day takes you. They are machine washable, but the precious fabric requires specific care instructions, so be sure to follow them carefully. I hope my gift guides have given you a little inspiration when it comes to your gift giving this year and to fit nicely with my baby gift guide I've teamed up with aden + anais to give away one of their Dream Blankets worth £58.00 to one lucky winner! To enter simply use the Gleam for below. Good luck and don't forget to enter my other blog competitions! I'd like to see a pink unicorn design to be released next. I like how it is! But little ducks would be cute too!! I would love to see a dinosaur theme. A collaboration with Disney would be great! I think the whole unicorn, mermaid, bright colour trend would be cool. How about Ballet :- Given that Prince George has Ballet at school. Gender Equality. Also Royalty has Modernised in regards to lineage, as Princess Charlotte next in line to throne following her older brother :- George ( at present time, and will not change following birth of any of their siblings). A variety of Ballet themes could be nice. Could encourage us to learn more in regards to Ballet. I believe Ballet is good for posture, muscle tone, exercise, etc. We could learn the stories, messages, etc from each individual Ballet. I'm thinking big fluffy clouds. A couple of cuddling kittens!! I'd like a spring scene with lots of butterflies or ladybirds. A silvery snowflake design would be lovely. I'd like to see any more wildlife themes; can never get enough of those! I would love to see a birds design something like parrots would be lovely. Numbers or Letters. I try to gift my nephew anything that can turn educational! I would love a yellow and grey theme! I'd love a sky blue with clouds and rainbows design. This is absolutely stunning. Id love to see owls on your next blanket design! This is lovely. I would love to see a pale yellow one with animals on it. I adore pigeons and doves but it is really difficult to find them as characters in current designs. I would love to see a unisex neutral dove pattern and a unisex bright pigeon pattern. I like the designs that look like children have drawn them, the little stick men and women. Do they have a Unicorn theme yet? If not, I think that would be a great idea. I do love green, so something forest related would be nice. I would love to see a Peter Rabbit Collection theme, although copyright may be a problem. Alternatively simple drawings of cats or dogs in brown on white muslin would be unisex and, in my opinion, popular.